Concord, N.C. – The suspension of Jeremy Mayfield for failing a drug test continues to cause aftershocks in the NASCAR garage. Drivers expressed concern about taking basic medicines, and seemed to be seeking answers to a growing list of questions. Mark Martin said he’d like to know just exactly what it was that Mayfield is accused of taking. “I do feel that we would all feel a little bit better if we knew, because when you pick up the paper and you see NASCAR zero tolerance what does that mean?” he said. “If you’re taking something as prescribed what does zero tolerance mean? “So it’s just a little bit scary It’s a little uneasy It’s our careers man. Most drivers seem to have determined that it’s best to contact Dr. David Black, who administers the testing program, if there’s any doubt about what they can and can’t take. Matt Kenseth said all drivers were given Black’s cell phone number and urged to call him with questions during a meeting earlier this year. “I felt pretty comfortable…when we got done with him,” Kenseth said. Greg Biffle, after listening to NASCAR chairman Brian France field questions about the issue, said he believes most drivers will err on the side of caution in the future. “Anything you take is questionable,” Biffle said, adding the best choice in the future may be to “just tough it out” when he’s ailing. 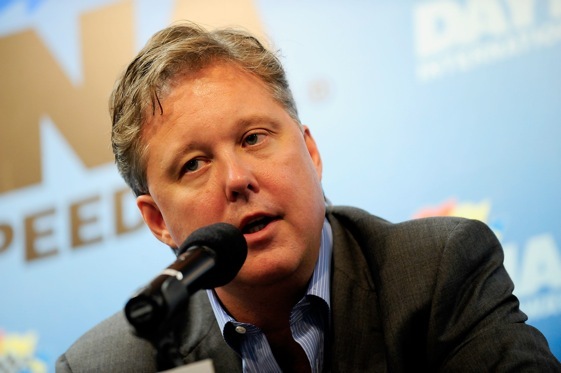 France defended NASCAR’s policy, calling it the toughest in the sports business, and also stood behind the decision to not reveal what exactly it was that Mayfield tested positive for. He did say there is an appeal process whereby Mayfield can – and apparently is – challenging the results of the findings. “That is what we’ve done with Jeremy and everyone else that has violated the policy,” he said. Jeff Burton was among the drivers saying he’d like more information, such as the type of drugs found during random tests, to be made public. Burton said he’d been tested several times this year, at Daytona and Bristol and possibly another time or two. France said he and other NASCAR officials as well as team owners also are subject to testing. There also seems to be much debate over whether there is a list of banned substances. France said he might at some point make public the substances that are banned. “We certainly will consider discussing that list with the media as well,” he said. Nascar only cares about $$$$$$$$$$$$$$$ and nothing else if one of the power house drivers gets caught we will never know about it. Mayfield is dispensable and does not bring any $$$$$$$$$$$$$ to Nascar. they will not reveal what the drug was and if they do it will be a LIE.